For my hundredth post (yes really 100-I can't believe it), I decided it was time you got to put a face to these random posts. So, here I am! Blah! Is that a corduroy jacket? 'Cause seriously, I love corduroy jackets. 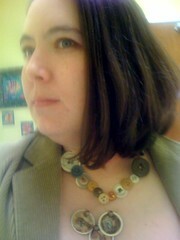 And I am so not a button-craft kind-of-gal, but I LOVE your necklace!!! Bellakarma - yes, it is corduroy (thrifted at that) and my favorite at the moment. Thanks (about the necklace).